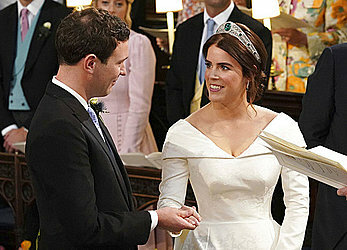 Eugenie's sister, Princess Beatrice, served as maid of honor — she read a selection from F. Scott Fitzgerald's "The Great Gatsby" during the service. Kate, the Duchess of Cambridge, wore a fuchsia dress by Alexander McQueen and a hat by Philip Treacy — Britain's premier milliner. Meghan, the Duchess of Sussex, wore a navy dress and coat by Givenchy.